Inside a cloud-shaped outline, a short-haired man stands with hands on his waist in a defiant position, engaged in conversation with a bespectacled man sitting in a comfortable chair. Short-haired standing man: Look Tim. If we're really sorry, let's add back Google Maps. Otherwise the apology is just words and I'm not signing it. Bespectacled seated man: We're not restoring Google Maps. Now sign it or else. Short-haired standing man: Oh yeah? I'm hereby or elsing you first! Outside the cloud-shaped outline and to its right the same bespectacled seated man is visible with both hands hands outstretched forward and up. Nearby a woman's head and shoulders are seen. Bespectacled seated man: GAK! Forstall or elsed me! Woman: Mr. Cook! You dozed off and had a bad dream. Bespectacled seated man: I need a calming ride. Get my helicopter ready. The next panel begins with text from the narrator. A man and a woman are seated in an automobile, the man holding the steering wheel and the woman sitting by his side in the passenger's seat. In the next panel we see that the automobile is half-immersed in shallow water, with waves surrounding the automobile and also surrounding a distant island. Birds fly overhead above the island. The water shows the reflection of the island, of the birds, and of a tree that grows on the island. In the sky a helicopter is seen, the sound of the helicopter blades being represented by the repeated word: WHUP! WHUP! WHUP! 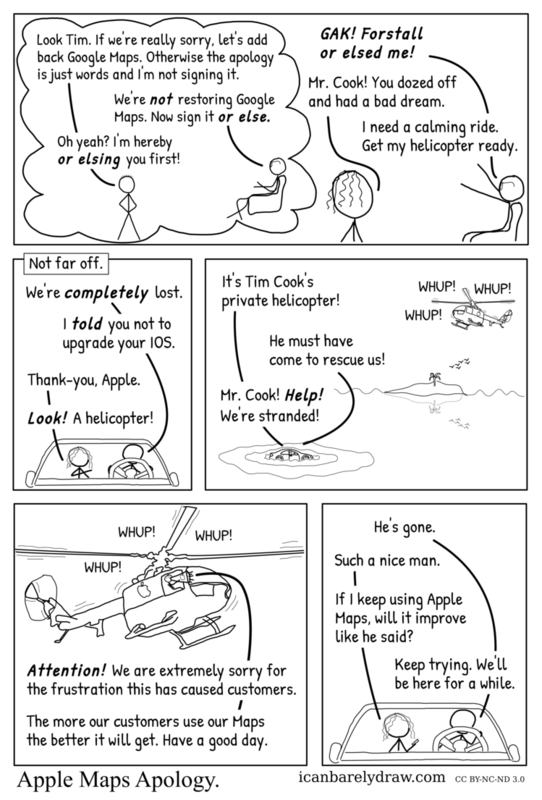 Voice 1 from automobile: It's Tim Cook's private helicopter! Voice 2 from automobile: He must have come to rescue us! Voice 1 from automobile: Mr. Cook! Help! We're stranded! The next panel shows a close-up view of the helicopter. The sound of the blades is again shown as: WHUP! WHUP! WHUP! In the helicopter, faintly visible, is a human figure that holds a megaphone in its hand and points it outside of the helicopter. Voice from megaphone: Attention! We are extremely sorry for the frustration this has caused customers. Voice from megaphone: The more our customers use our Maps the better it will get. Have a good day. The last panel shows the man and the woman again, still seated inside the automobile. The woman holds a small object in her left hand that could be a smartphone. Woman: Such a nice man. Woman: If I keep using Apple Maps, will it improve like he said? Man: Keep trying. We'll be here for a while.